What’s wrong with this caption? Men wielding batons and wearing yellow armbands evoking Lebanon’s Hezbollah attacked protesters outside the Iranian Embassy in Beirut on Sunday during a rally against the militant group’s participation in the Syrian civil war. One protester was killed, a senior Lebanese military official and witnesses said. A military statement said the protesters had just arrived at the embassy area when clashes broke out and a civilian opened fire. The embassy is in a predominantly pro-Hezbollah area. Witnesses saw men wearing yellow armbands-the color of Hezbollah’s flag-attacking the protesters with batons. It was unclear if they t were affiliated with the militant Shiite group, and the identity of the gunman was unknown, a senior security official said. 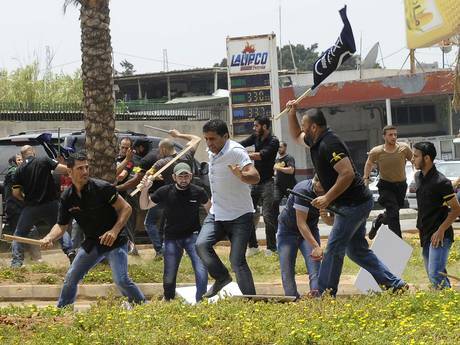 Hezbollah supporters fought Sunday with backers of a rival Lebanese party by the Iranian Embassy in Beirut, Lebanon. 1. Read the news excerpt, then look at the photo and read the caption below the photo. What type of bias is the caption an example of? 2. How important do you think photos/captions are to a reader's impression of a news story? Explain your answer. 3. Do you think that the Wall Street Journal intentionally mislead readers? Explain your answer. 4. Write a more accurate caption for this photo.